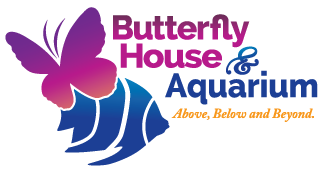 The Butterfly House & Aquarium is a unique combination of tropical butterflies and aquatic exhibits. The Butterfly House is a tropical paradise with more than 900 butterflies free-flying in a rainforest type habitat with water features; including, a waterfall and river cascading into a koi and goldfish pond. New butterflies are purchased weekly from butterfly farmers around the world. Then they are displayed in a special window which showcases our new arrivals as they await emergence. The Aquarium has the our interactive stingray pool, tidal touch pool, and 360-degree Pop-Up Dome tank. Visitors may touch sea cucumbers, sea stars, sea urchins and more on their excursion. Our Discovery Den offers guests the opportunity to learn about Butterfly Life Cycles, Moon Jelly Life Cycles, and South Dakota's history with marine life and also contains a reading area.